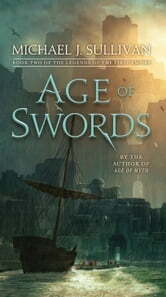 **The gods have been proven mortal and new heroes will arise as the battle continues in the sequel to Age of Myth—from the author of the Riyria Revelations and Riyria Chronicles series. In Age of Myth, fantasy master Michael J. Sullivan launched readers on an epic journey of magic and adventure, heroism and betrayal, love and loss. Now the thrilling saga continues as the human uprising is threatened by powerful enemies from without—and bitter rivalries from within. Raithe, the God Killer, may have started the rebellion by killing a Fhrey, but long-standing enmities dividing the Rhunes make it all but impossible to unite against the common foe. And even if the clans can join forces, how will they defeat an enemy whose magical prowess renders them indistinguishable from gods? The answer lies across the sea in a faraway land populated by a reclusive and dour race who feel nothing but disdain for both Fhrey and mankind. With time running out, Persephone leads the gifted young seer Suri, the Fhrey sorceress Arion, and a small band of misfits in a desperate search for aid—a quest that will take them into the darkest depths of Elan. There, an ancient adversary waits, as fearsome as it is deadly. Absolutely love this book buuuuut I've loved everything Michael has written even hallowman! I actually have a special edition autographed copy of this book! Entertaining from cover to cover. Wonderful, strong, female characters. Great read. Enjoyed the character development and there were always new twists and action. Wish I didn't have to wait until 2018 for the next in the series.